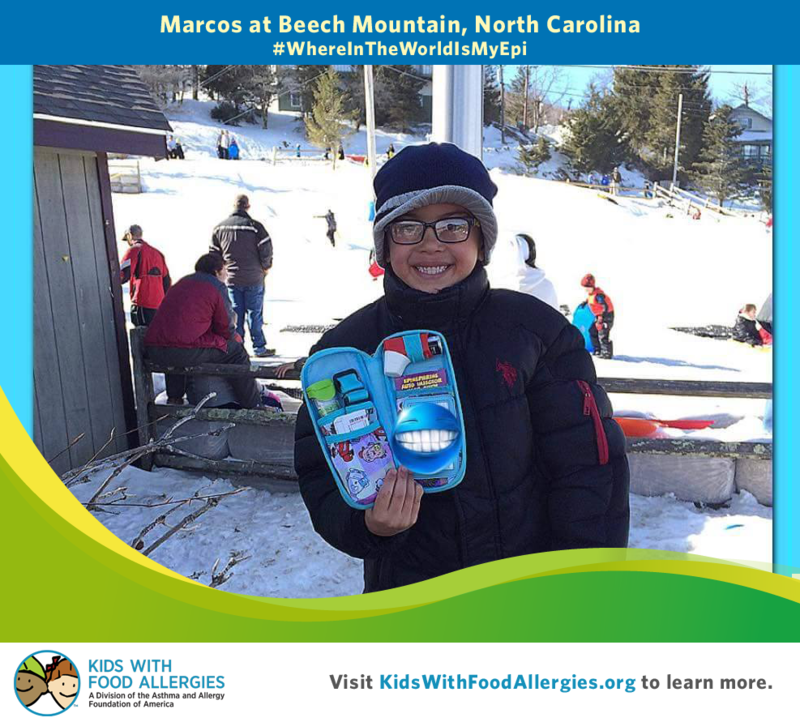 Kids With Food Allergies is happy to announce the first winner of this year’s #WhereInTheWorldIsMyEpi campaign. Marcos is an adorable, happy, six-year-old boy from Florida who proudly showed us his epinephrine in a photograph taken during a vacation to North Carolina. “Although it has been challenging at times and he doesn’t always understand why he can’t just eat whatever he wants, we have tried really hard to help him understand that he is not ‘different’, his body just doesn’t like peanuts,” wrote his mom, Adelaida. His allergy was discovered when he was one and a half. The winning picture was submitted on our Facebook page. Marcos’ family wins $400 in Certified asthma and allergy friendly™ products. Next month, the winner could be you! Show us your epi on your journeys this year! Studies show many people leave their emergency medicine behind, so take yours with you – to the park, to sporting events, to the movies, anywhere you go. Remember, epinephrine is the only treatment for anaphylaxis (anna-fih-LACK-sis). Anaphylaxis is a serious allergic reaction that must be treated immediately. Check out our contest announcement here for more information. Each month in 2015, we’ll pick one winner to receive a $400 in Certified asthma and allergy friendly™ products of the winner’s choosing! This campaign is sponsored by Mylan Specialty, maker of the EpiPen™ brand of epinephrine auto-injector. Marcos is our January 2015 winner; our February 2015 winner will be announced in early March. Our next winner will be selected on March 9th, so share your photo now!